IT’S BEEN A rollercoaster of a year. Icons like David Bowie and Prince have died. Brexit happened and Trump will be inaugurated as US president next month. But it’s not all been doom and gloom no matter what Twitter and Facebook tell us. There’s still a lot of things which happened this year which make you proud to be from this floating rock in the middle of the Atlantic Ocean we call home. It’s been a great year for sport and looking back at our history. Commemorations for Easter Week, 1916, culminated in a grand display through the capital in March. There have been many events to celebrate the rebellion which kick-started the War of Independence three years later. But it was on 27 March when thousands gathered along the capital’s streets to hear Commandant Pat Kelleher read the Proclamation of the Irish Republic, 100 years after Padraig Pearse had read the same words outside the GPO, that put a tears in many eyes. It was an event which captured the hearts and minds of millions of Irish at home and abroad. The celebrations were so impressive that they caught the attention of the world’s media. He’s loud and brash, crass but class. Love him or hate him, Conor McGregor made history this year, all the while draped in the tricolour. He became the first person ever to hold two different UFC belts at the same time. What is even more remarkable is that four years ago, McGregor was drawing Jobseeker’s Allowance. Now, his fortune is estimated to be nearing €50 million. His is a story which is inspirational and a message to anyone that they can achieve anything if they to put their mind to something. His love for his country is also obvious. After winning his first belt, he screamed: “Ireland, we did it baby,” earning his place in Irish sporting folklore for generations to come. She’s become an established Hollywood actor in the past year and her star doesn’t seem to be waning anytime soon. But it’s Saoirse’s attitude to life and her personality which have really captured the hearts of the Irish and the US in the past 12 months. From trying to explain how to pronounce her name on chat shows to plugging the life out of a Dublin beauty shop, she’s gone and become one of the nation’s best exports. With movies like Brooklyn packing out theatres across the world, we expect Saoirse to pop up on this list next year as well. We can’t finish this post without mentioning the Irish at the Euros. There was a bit of a sycophantic love-in between those at the event and those at home wanting to tell the world how well-behaved we were. But, let’s be real. 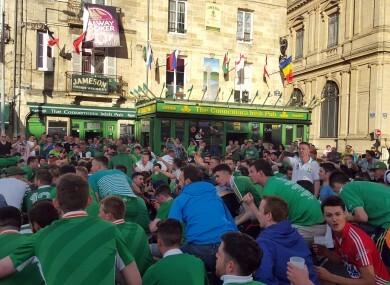 There’s a lot of doom in the world, especially in France, which hosted the Euros. That country has seen so much heartbreak in the past 18 months. So, it’s fine to rejoice in watching Irish fans singing to nuns or fixing a flat tyre or repairing a dent on a car. It’s better than getting involved in riots and throwing coins at refugee children, something which fans of another country were caught doing. This picture summed up GAA for a lot of people when it went viral back in August. The image of Jennifer Malone from Kildare, wearing a Kilkenny jersey, spread like wildfire online soon afterward it was beamed around the world. She was seen consoling Waterford free-taker Pauric Mahony who came agonisingly close to levelling the scores late on against Kilkenny in the All-Ireland semi final replay. The Deise player then sent her her his jersey from the replay along with a framed photo of their heart-warming moment at Semple Stadium. We’re a nation which loves to sing, especially ballads. So, when a video of two Irish guys singing an Adele medley went viral, we weren’t surprised. However, we were surprised when the English singer invited them on stage to sing with her when she came to the 3Arena in March of this year. The O’Donovan brothers and Annalise Murphy took home silver in rowing and sailing respectively. Murphy was rightly lauded for her determination, having missed out at a medal in London in agonising circumstances in 2012. After leading the race for so long, she finished fourth. She went two better this time around and captured silver for Ireland. The O’Donovans completed a similar task, taking home silver as well in the double sculls event. But it was the cheekiness of their interviews after their win which captured the hearts of the nation. From saying ‘we better be careful what we say to these boys’ before the BBC interviewed them to dropping a ‘tiocfaidh ár lá’ to RTÉ after their victory, their roguish attitude was lapped up by the public. It’s been a very tough year but there were a lot of positives to take out of 2016. We look forward to adding to the list in 2017. Email “Moments that made you glad to call Ireland home this year ”. Feedback on “Moments that made you glad to call Ireland home this year ”.